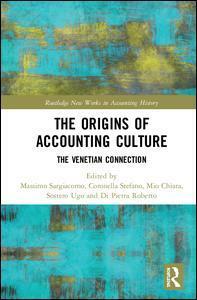 The Origins Of Accounting Culture aim at studying the origins of the accounting culture in Venice, with a specific focus on accounting education. The period covered by the work ranges from Luca Pacioli to the foundation (in 1868) of the Royal Advanced School of Commerce (Regia Scuola Superiore di Commercio), that in 2018 is celebrating its 150 anniversary as Ca? Foscari University of Venice. Ever since the Middle Ages, Venice was home of a number of favourable circumstances that have been accumulating over the years. As a trading city par excellence, Venice allowed the spreading of the bookkeeping at first among firms and then in the public administration that was much in need of sophisticated accounting principles for the purpose of controlling its activities. Venice was among the first cities to implement Gutenberg print method and it quickly became the most important city in the world in the publishing industry, allowing printing and spreading the first handbooks about double-entry bookkeeping and merchant studies. The Origins Of Accounting Culture goes beyond the study of Luca Pacioli and tackles in a more organic and holistic way the social and economic conditions that allowed the accounting culture to spread in Venice. This book will be a vital resource to academics and researchers in the fields of Accounting, Accounting History, Economic Development and related disciplines. Niccolò D’Anastasio and his "Scrittura doppia ridotta scienza"
Fabio Caputo, Stefano Coronella, Rossella Leopizzi and Andrea Venturelli. The fraudulent investor: an accounting investigation on a Venetian manufactory, 1778-1784.